The passbook is the traditional record of savings account transactions. 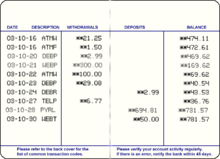 Withdrawals from a savings account are occasionally costly, and they are more time-consuming than withdrawals from a demand (current) account. However, most saving accounts do not limit withdrawal unlike certificates of deposit. In the United States, violations of Regulation D often involve a service charge, or even a downgrade of the account to a checking account. With online accounts, the main penalty is the time required for the Automated Clearing House to transfer funds from the online account to a "brick and mortar" bank where it can be easily accessed. During the period between when funds are withdrawn from the online bank and transferred to the local bank, no interest is earned. A savings account linked to a checking account at the same financial institution can help prevent fees due to overdrafts and reduce banking costs. Financial institutions such as Ally Bank, EverBank and Synchrony Bank do not have traditional 'brick and mortar' branches, and instead function as direct banks. These banks offer online savings accounts which pass on some of the reduction in overhead to depositors in the form of higher interest rates. For comparison, the savings account products at traditional megabanks such as Bank of America, Wells Fargo, Chase, etc. offer interest rates of 0.01 APY. The depositor must accept a 2-3 business day delay in transferring funds (typically via ACH, although wires are available for a fee) from their online account to an outside account or merchant. Apart from this, however, online banks are readily accessible via Mobile and Internet browser platforms. Financial advice websites such as MoneyUnder30.com suggest depositors consider the use of an online savings account for their Emergency Fund or other liquid savings needs. ↑ Budden, Robert; Cumbo, Josephine (7 July 2006). "Offshore investors beat EU directive to avoid tax". Financial Times. Retrieved 28 November 2010. ↑ "H.R.1163 - 109th Congress (2005-2006): Lifetime Savings Account Act of 2005 | Congress.gov | Library of Congress". Congress.gov. Retrieved 2016-11-20. ↑ "Banking: Savings Accounts 101 | Investopedia". Retrieved 2015-09-24. ↑ Jeanne Lee (2016-10-14). "Best High Yield Online Savings Accounts of 2016". NerdWallet. Retrieved 2016-11-20. ↑ "Savings Accounts - Open a Savings Account Online". Bankofamerica.com. Retrieved 2016-11-20. ↑ Amber Gilstrap (20 May 2014). "Emergency Funds: Everything You Need To Know". moneyunder30.com. Retrieved 20 November 2016.